When Earth is destroyed, a young emperor must question what it means to be human as he fights to save the interplanetary community. In the year 2937, there has been peace for 600 years, but now the Goth Alliance is waging full-on interstellar war. 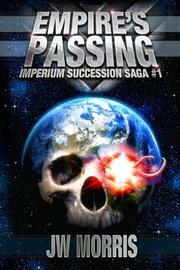 When an attack by the Goths destroys Earth, capital of the star-spanning Imperium empire, Duke Michael Landsman of New Meyer loses his father and succeeds him as emperor. While the Imperium possesses the force and weapons technology to defend themselves against conventional attacks, the Goths have a secret weapon. The Goth Alliance leader, the High Priestess of the Goddess Nearyahn, threatens to break through Imperial defenses from within their own minds: She exerts parasitic control over humanoid thoughts and feelings by using their sexual appetites to insert splinters into their brains. Meanwhile, the Passimians, a race several billions of years old that exists outside of traditional timelines, have identified humans as a Chosen race with the potential to join them outside of time; their assistance just might be the secret weapon Duke Michael needs to save his people—but it won’t come without making some difficult choices. In his debut novel, the first in the Imperium Succession Saga, Morris sets the tone when Earth is destroyed in the first chapter. Yet while the well-developed characters and fast-paced narrative quickly draw readers in, the sheer quantity of characters and the story’s complexity are likely to confuse and leave some readers behind. The novel is built on the solid foundation of current scientific technologies and innovations, and the well-researched parallels to Earth’s history bring a rich literary depth that distinguishes this novel from some of the pulpy space sagas out there. Military and political geeks will enjoy the depth in which the Imperial governmental structure is described as well. A richly woven space saga that will leave sci-fi fans anxious for the next installment.